Size: Tooth is 5.1 inches long! 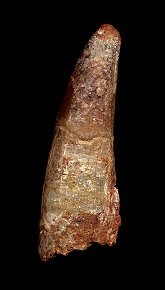 This is an extremely large Spinosaurus aegyptiacus tooth from the Cretaceous of Morocco. Spinosaurus was a large, carniverous dinosaur that is also known as the ''Thorn Lizard''. This HUGE, conical tooth is extremely 3-dimensional and very displayable on both sides. The very tip of the tooth exhibits a large amount of wear from use, meaning the tooth was in the mouth for a very long time. Most of the enamel is still present, and the natural color of the tooth is quite aesthetic..Dinosaur teeth this large are almost never found, and ones this distinct are extremely rare (and usually well over $1000!). This is a HUGE TOOTH (over FIVE INCHES LONG!) from this ferocious, sail-backed dinosaur, prominently featured in the movie, ''Jurassic Park 3''.